Enjoy an early summer evening, tasting wines, touring historical buildings and listening to music under the stars in the museum courtyard. The Addison Historical Society, The Addison Center for the Arts, and the Knights of Columbus are pleased to present a wine tasting fundraiser “Addison Uncorked” on Tuesday, June 19 from 6-9 pm on the grounds of the Addison Historical Museum. Guests will be able to sample a variety of wines while touring the Historical Museum’s exhibits and period home. Hector Fernandez, a guitarist, will perform popular classics in the museum courtyard. Light refreshments will be served. The wine tasting event benefits each of the sponsoring not-for-profit organizations. The Addison Historical Society collects, preserves and exhibits documents and artifacts relating to local history. The Addison Center of the Arts presents visual and performing arts. The Knights of Columbus raise funds to support social service organizations doing good work in the community. 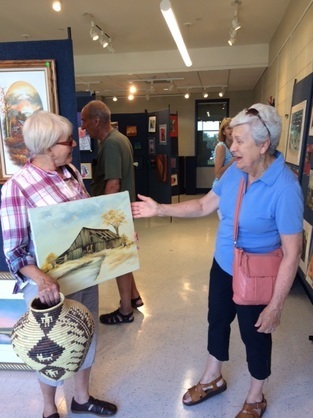 ​The first annual Fundraiser Starving Artist Sale was a huge success! There were many buys and deals, as seen in this picture of Evelyn Berleman and Laverne Tedzinski walking out arms full! All money raised will go toward the design of and artwork for the entrance of the gallery. Next year will be bigger, with many surprises and events for everyone. This fundraiser event took place Friday, April 29 from 7-9 p.m. at the Village of Addison Rotunda (1 Friendship Plaza, Addison, IL). Admission was $35. Cost included 2 drink tickets. The event included a silent auction.